Experience the most important moment in your lifetime, with your family & friends right by your side. Why rent an impersonal chapel or banquet hall, when you can host the entire event in one place? When booking for a wedding always call the reservationists the event fee has to be added in on top of any rental rates. We have to have a lot of information that goes along with a wedding. Weddings can be as simple or elaborate as you decide you would like. Many couples plan a cabin wedding on the lake with family staying all around. It becomes a family reunion weekend. We can also accommodate your lodging needs while you plan a wedding at a church, chapel or other location. Talk with us about how we can make your wedding dreams come true. Our most popular homes for weddings and family events such as vow renewals and anniversaries is Ponderosa. 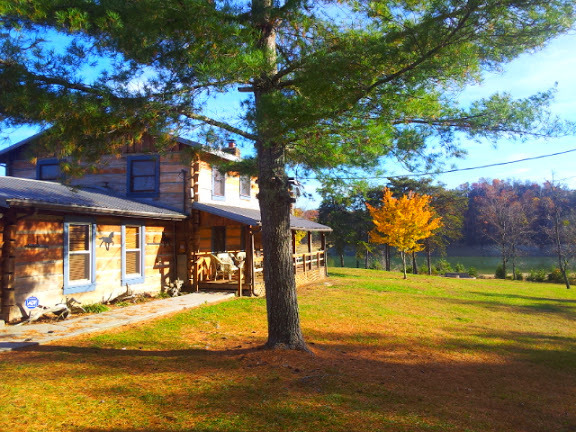 This authentic log cabin has been host to several intimate ceremonies. Intimate ceremonies in the colder months held inside are just as beautiful as larger ceremonies held on the waterfront at Sunset. With 7 Bedrooms; a sleeping potential of up to 17 and some of the best rates around, Ponderosa is also a great choice if your trying to stretch dollars! Plan a Weekend Wedding, and invite your guests to stay! You can house up to 4 more couples in their own private rooms, in addition to yourselves, and even a few miscellaneous single guests too. Think of Ponderosa as a blank canvas, for you to decorate & customize to your liking. A place to bring your closest family & friends to celebrate your special day, or weekend. It has all the basics you’ll need to get started and it’s private location on the lake is priceless!